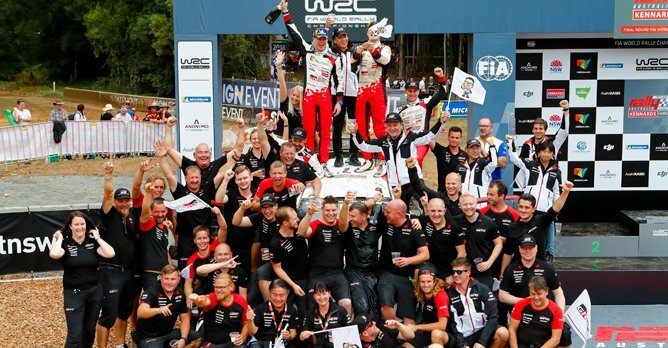 The Toyota Gazoo Racing World Rally Team claimed the FIA World Rally Championship manufacturers' title in style at the final round in Australia. The Toyota Gazoo Racing World Rally Team claimed the FIA World Rally Championship (WRC) manufacturers' title in style at the final round in Australia with a rally victory for Jari-Matti Latvala. This is the fourth occasion that Toyota has won the manufacturers' title in the WRC and the first time since 1999 Esapekka Lappi finished in fourth place to help Toyota clinch the manufacturers' crown in just the second season of its return to the WRC. It is the fourth occasion that Toyota has won the manufacturers' title in the WRC and the first time since 1999. The strong performance of the Toyota Yaris WRC was demonstrated again on the final round, with Ott Tanak and Latvala moving to the top of the leaderboard during Saturday. Sunday was characterised by very muddy and slippery forest stages with the tricky conditions catching out a number of drivers. These included Tanak, who had to retire on the penultimate stage after hitting a tree. Latvala, co-driven by Miikka Anttila, avoided mistakes and took three stage wins on the final day to clinch victory by 32.5 seconds - the team's fifth win of 2018. Lappi also won a stage to complete a strong drive in his final event before departing the team. Tanak, Latvala and Lappi finished the season third, fourth and fifth respectively in the driver's standings, with Tanak fighting for the drivers' title until the final day in Australia, and all three contributing significantly towards the manufacturers' title.